When my wife's friends planned for a get-together last December while we were on vacation in the Philippines, I was - as they say, part of the package. But personally I was also looking forward to the dinner because my college friend and fellow working student Leila was going to bring some of her cooking as well, and they have been saying how good a cook she is. Especially her pasta. Unfortunately, some family engagements prevented her to cook her special pasta dish. 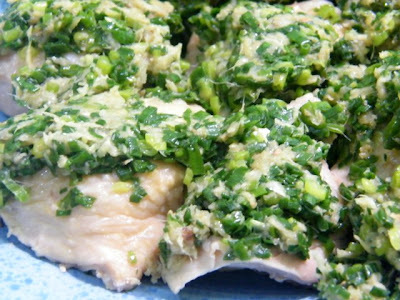 But she still came up with something quick and easy to do: Steamed Chicken. I loved it because of the play of flavour between the ginger and the spring onion and the simple, delicate taste of steamed chicken. Have I told you how much I love ginger? I just had to have the recipe, now here on adobongblog for your enjoyment as well. Rub salt on the chicken pieces and leave in the ref preferably overnight. If pressed for time, a couple of hours will do. Steam the chicken pieces for 15-20 minutes or until tender. While the chicken is steaming up, mix the spring onion and ginger with a sprinkle of salt in a bowl. Heat up the olive oil. When it is near frying temperature (which only takes a while), pour into the bowl with the spring onion and ginger and mix. Arrange the chicken pieces side by side on a plate and top with the above mix. Serve warm. Drizzle with a bit of olive oil if desired.